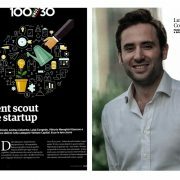 We are pleased to announce that Luigi Congedo, Principal at BootstrapLabs, has been included in Forbes 2018 list of 30 Under 30 for his contributions to Technology & Venture Capital. 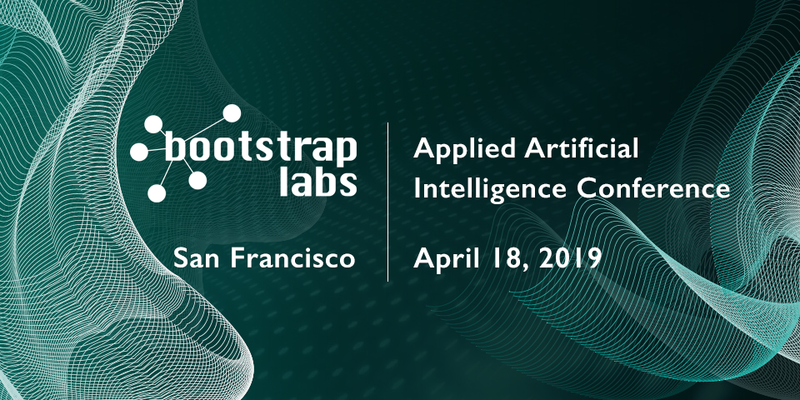 In the past four years at BootstrapLabs, Luigi has connected with thousands of start ups in both Silicon Valley, Italy and the world and has focused his work primarily on investments within the Applied Artificial Intelligence space. During this session, Richard Socher discussed the state of AI today across different industries including robotics and healthcare and where he sees the biggest potential for AI in the future. AI is impacting several industries and has provided incredible advancements (radiology, cancer treatment, etc) but there’s limitations. Fully autonomous movement in robotics and self-conscious AI are still far away. In theory, with the right political structure, AI could be used to cover all basic necessities including food, housing and security. It’s important to think about diversity in AI in terms of: the kinds of problems we’re working to solve, the kinds of people working on those, and the data sets the algorithms are trained on. 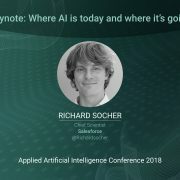 Richard Socher is Chief Scientist at Salesforce where he leads the company’s AI research efforts. Prior to Salesforce, he was the CEO and founder of MetaMind, an AI startup acquired by Salesforce. Socher has received numerous awards and grants including the Distinguished Application Paper Award at the ICML, the Yahoo! Key Scientific Challenges Award, a Microsoft Research PhD Fellowship, and the GigaOM Structure Award. Socher’s PhD from Stanford on deep learning with Chris Manning and Andrew Ng won the best Stanford CS PhD thesis award. 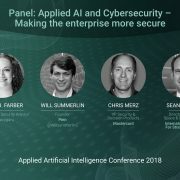 During this session, the panelists discussed the future of authentication, leveraging AI to prevent and detect threats and security around databases that collect our information. AI is the only way to figure out and prevent future cyber attacks, it’s impossible for people to process the abundance of data required for the analysis. 81% of data breaches in 2017 were perpetuated due to a stolen password, sensor data and biometric information are the key to authentication in the future. It’s important to invest in management and security for databases, all biometric puzzles turn into cybersecurity issues if the database that gathers the information can be compromised. 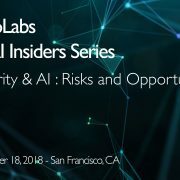 Debra J. Farber is a data privacy and information security executive and entrepreneur with 14 years of data strategy, operations, public policy, training, product, and compliance experience. Debra served as Sr. Director, Global Public Policy (Security & Privacy) at Visa where she oversaw a portfolio of issues, including: privacy, cybercrime, cybersecurity, product security, risk and more. Debra held privacy and security leadership roles at IBM, American Express, Farber Strategies and more. Debra holds a BA in English from Binghamton University, a JD from Brooklyn Law School and is completing her Executive Certificate of Business Excellence from UC Berkeley. 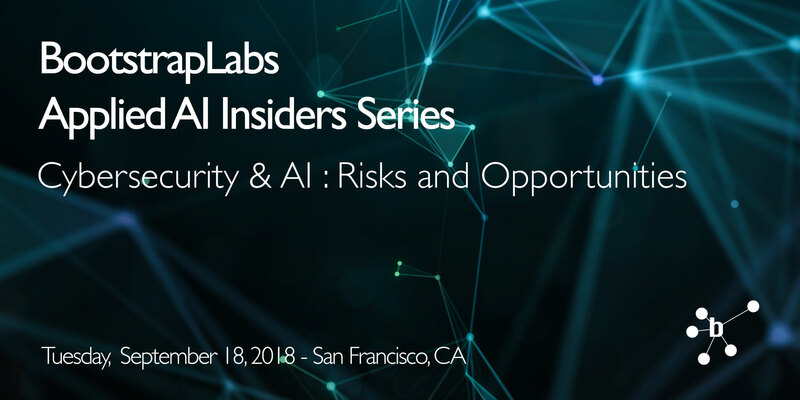 Will Summerlin is the Founder and CEO of Pinn, a cybersecurity company using AI to solve the digital identity crisis. He’s also an advisor to Story Ventures. Dr. Chris Merz is the vice president of Security and Decision Products for the Enterprise Security Solutions product team at Mastercard. He is responsible for decision science and associated data strategies for real-time, transaction-level decision and fraud monitoring solutions. Since joining Mastercard in 2001, Dr. Merz has applied machine learning and data science techniques to applications in cardholder segmentation, loyalty solutions, recommender systems, and fraud detection. 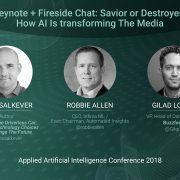 He holds a PhD in Information and Computer Science from the University of California – Irvine, and is a recognized researcher in Machine Learning, with over 20 published conference and journal articles. He is also an adjunct professor at the Missouri University of Science and Technology since 2004. Sean serves as Director of the Future Conflict and Cyber Security program at the International Institute for Strategic Studies and Chair of the Research Advisory Group for the Global Commission on the Stability of Cyberspace. He advises governments, corporations, and entrepreneurs on the future of information technology. Sean served as the United States’ first National Intelligence Officer for Cyber Issues from 2011 to 2016. He has a decade of experience working in government including with the CIA’s Information Operations Center, the White House National Security Council, and more. Prior to government, Sean practiced law with Skadden Arps in New York, specializing in mergers and acquisitions, corporate finance, and banking. He holds degrees from Harvard University, the London School of Economics, and the University of Oslo. He also proudly serves as a Trustee of the Center for Excellence in Education in McLean, Virginia. During this session, the panelists discussed AI in healthcare, the complexity of all stakeholders in the industry, the ROI impact of AI, and the differences between AI in healthcare startups and Big Pharma. AI can be applied to many parts of the healthcare process from drug discovery to design, manufacturing and clinical trials, but the key is to find places where you have good quality, clean data. Only one in ten companies leveraging AI in Healthcare meet the requirements to have meaningful impact in the space. To convince executives to pull the trigger on these technologies, you need to demonstrate how AI will bring value to different complex stakeholders: hospital management, doctors and nurses, pharmaceutical companies and patients. Daniel Faggella is the Founder and CEO at TechEmergence, the only market research and company discovery platform focused exclusively on artificial intelligence and machine learning. Daniel is a serial entrepreneur and has grown and sold two previous companies. He is a graduate of University of Pennsylvania with a masters degree in cognitive science. 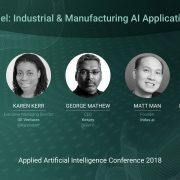 Dr. Kefeng (Kevin) Hua has 20 years of experience working in design and development of AI/Machine Learning applications in healthcare, insurance, banking, retails and manufacturing industries. He is currently a senior manager with the Digital Health Intelligence Group of Bayer, responsible for developing AI/ML applications. Prior to Bayer, he was a machine learning specialist at Deloitte Consulting and a research manager of AI at Center for Advanced Research of PwC. His work in analytics has won the Analytics Leadership Award from IU Kelley School of Business in 2014 and INFORMS Data Mining contest in 2008. Dr. Garcia-Rizo is the Chief Business Officer of Just Biotherapeutics, an AI-driven platform that brings Antibody-based molecules faster. Carolina has more than 15 years experience in the biopharma and diagnostics industry and worked at Thermo Fisher Scientific, Roche Molecular, Cepheid, MIT, and Max Planck Institute. Carolina has an MBA from MIT and a Ph.D. in Atomic and Molecular Physics at C.S.I.C., C.N.R.S. and UC Berkeley, where she was Fulbright Scholar. 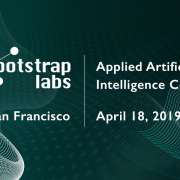 BootstrapLabs AAI18 Panel – Applied AI in FinTech: Faster, Cheaper, Better? 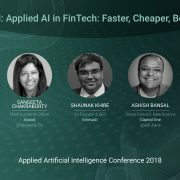 During this session, the panelists discussed AI in finance technology, data privacy and security, interpretability of algorithms and the need for a strong relationship with regulators. For AI to deliver value in FinTech, interpretability and explainability are important, you need to be able to prove where your model comes from and have strong documentation. You need to make sure the right controls and processes are in place to ensure data privacy and security. Developing a strong relationship with regulatory agencies is key to make sure your model is unbiased and explainable and be able to influence regulators into adopting better, more complicated models. Ash joined Zetta Venture Partners – the first venture capital fund focused on intelligent systems – with Mark Gorenberg at the time it launched. Ash is a board member of and lead investor in companies such as Kaggle, Invenia, Clearbit, Tractable and Focal Systems. Before Zetta, Ash started the money side of AngelList, launching online investing, managing $130M over more than 250 funds, creating the first startup ‘index fund’ and more. Ash previously co-founded Topguest, a Founders Fund-backed company that built customer analytics technology. Sangeeta is the Chief Customer Officer at Ayasdi. Prior to Ayasdi, Sangeeta built multiple professional services practices across a number of successful startups including Digital Fuel (acquired by VMWare), Inquira (acquired by Oracle) and Interwoven. Sangeeta began her career in consulting with Tata, Fujitsu and Vitria. Shaunak Khire, is the co­founder & CEO of Emma/MANSI, an explainable AI for the financial markets. Shaunak started out as a mobile security consultant at British Telecom focusing on vulnerabilities in bluetooth standards. Previously Shaunak was a Board Member of a private equity backed DMP (data management platform), he has also served on the global board of the Mobile Marketing Association. Shaunak was a part of the Clinton Global Initiative tech & poverty alleviation groups and built the MaghaCGI30 Index a social impact index that weighs constituents based on CSR metrics. He is a contributor for TechCrunch and has been on MIT Technology Review’s 35 under 35 list in 2012. Ashish is a Senior Director of Data Science at Capital One. He uses AI/ML to generate insights from vast amounts of data and build interesting B2B, B2C and Enterprise products. He manages a product portfolio of 5+ products. Prior to Capital One, he co-founded GALE Partners and headed the Machine Learning group, building AI/ML based marketing automation products. He helped the company grow from 9 to 120 and setup the India office. Overall, he has over 18 years of experience in the technology industry, along with an MBA from Kellogg School of Management and B Tech from IIT BHU. Xavier is the VP of Product and Science at Trusted Insight. He’s responsible for bringing machine learning to the world of alternative asset management – Currently focusing on VC and Credit Markets. He is continuously improving the #1 social network for CIOs and alternative assets managers through Trusted Insight platform website and mobile experiences. https://bootstraplabs.com/wp-content/uploads/sites/4/2018/06/fintech_video_slide.001.jpeg 1080 1920 http://bootstraplabs.com/wp-content/uploads/sites/4/2018/08/Bootstrap-website_white_logo.png 2018-06-12 13:25:362018-07-08 01:47:08BootstrapLabs AAI18 Panel - Applied AI in FinTech: Faster, Cheaper, Better?